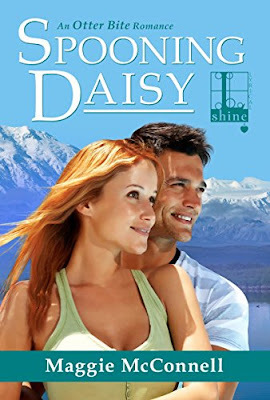 Goddess Fish Promotions has organized a Virtual Blurb Blitz Tour for SPOONING DAISY by Maggie McConnell, a contemporary romance (romantic comedy) available now from Kensington (Lyrical Shine). Be sure to follow the tour. The more you comment, the better your chances of winning. The tour dates can be found by clicking the banner below and at the bottom of this blog post. "I had apple strudel. I never have apple strudel. It's not my usual." "You came here to tell me you had apple strudel?" "The thing is...I liked it. For a change, I mean. Once. Not every day, of course." "The truth is..." He stepped toward her. "The truth is...I feel bad about giving you such a hard time at breakfast." "Ohhhh. This is an apology." "No, absolutely not." Max retracted the step he'd just taken. "This is absolutely NOT an apology." Daisy huffed. Normally, she'd take great satisfaction in Max's guilt and take equal pleasure in the banter that would surely follow. However, she was a woman on a mission, and she didn't have the time, not with Otter Bite hanging by a manila envelope. "Fine. Thank you for coming here NOT to apologize and for that apple strudel thing. And--" She momentarily softened. " --the money. But I just don't have the time for whatever this is." Once again he stepped toward her. "You're making this extremely difficult." "This? This what? What am I making--"
"This." The word melted into her mouth. The two hundreds floated from her hand to the floor. Then, her arms wrapped Max's neck, his body pressed hers, and Daisy was lost in a kiss she never expected to own. Maggie McConnell will be awarding a Kate Spade necklace: enamel "forget-me-not" blue flowers (U.S. only) to a randomly drawn winner via rafflecopter during the tour. December 6: 3 Partners in shopping, Nana, Mommy, and Sissy, Too!